It’s also a bit daunting accepting this responsibility, given the high calibre of my predecessors, many of whom are here tonight. I joined the committee when Akhtar was President, followed by Nicola, two top quality acts. I have to say its hard to follow on from Jon. His hard work over the last year has been an inspiration. Thankfully, he stays on the committee for a further year. Sadly however, we lose some committee members -and I add my thanks to Zaki, Ed, Julian, Nicola,and Tim. First toast – Jon Black and the retiring committee. The good news is we have retained all of our co-opted senior statesman-Steve Bird, Ray Shaw, Malcolm Duxbury and the legendary Paul Harris. We also have retained the services of Ali, Sandra, Rhona and Lucinda. 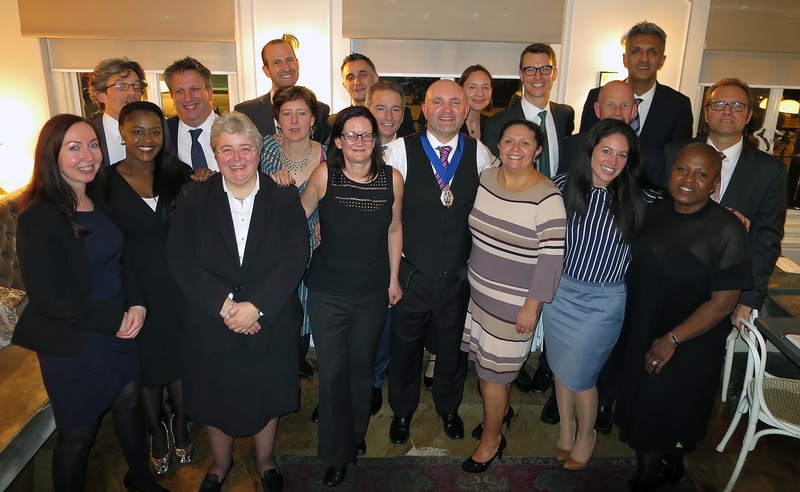 Rakesh becomes our treasurer, Mark Troman our secretary, Mel Stooks stays on as media officer,and will be looking after the Advocate, with which she will be helped by Emma Lipscombe, Diana remains training officer and Tony covers Law Reform. And the wonderful Jenny Wiltshire is a fantastic Vice-President. She has asked me to make it clear she does not wish to be President next year, so ladies and gentleman… there is a vacancy for next November! Our committee is diverse, and has firm owners, employees, freelancers, contract winners, contract losers, white-collar crime firms, legal aid firms and private, extradition lawyers, those that use in-house advocates and those who brief counsel. I want to keep this Association relevant and vibrant , meaningful and fun. We don’t just want to represent you, we want to involve you. So… President. How did that happen? Having been parachuted in at short notice, I’ve had very little time to prepare or get used to the idea. If I had planned this AGM, it wouldn’t have been in a swanky restaurant at £60 a ticket. I thought, none of my mates are going to pay that to come along on a Monday night in November. But here you all here, you fat-cats you! This magnificent attendance is,I think, an LCCSA record for an AGM, and shows this Association is in good fettle. I thank you. I still haven’t got used to the idea of being President. Mrs F, however has already become used to the idea of being a president’s wife. She has become increasingly gubernatorial, and very grand. Please do genuflect and pay all due obsequies before her. “Foxsmith did you c e n s o r e d ?! I know, you are disgusted. An Interview without caution, not advised of right to silence, and without an appropriate adult! I know what you are thinking. Outrageous! This hadn’t been raised in pre-interview disclosure! I was “convicted” in this shocking travesty of justice! As you are all lawyers I tell you this story in confidence and ask you to apply LPP- its certainly not a story suitable for social media! But I learned an important lesson from that experience. After qualifying, I started at EFBW 222 years ago this month. One of the first people I met there was newly qualified solicitor David Macintosh, who beame a good friend. We lost David this year (obituary here) and there have been others whose passing we mourn. Other heavyweight lawyers at the firm were my supervising partner Eddie Preston, Howard Riddle (now Chief Magistrate), Nigel Dean (now DJ Dean) John Lafferty (now HHJ Lafferty, and my good friend and outstanding lawyer Peter Fallen, who I am delighted to see here tonight. And not forgetting Paul Harris. 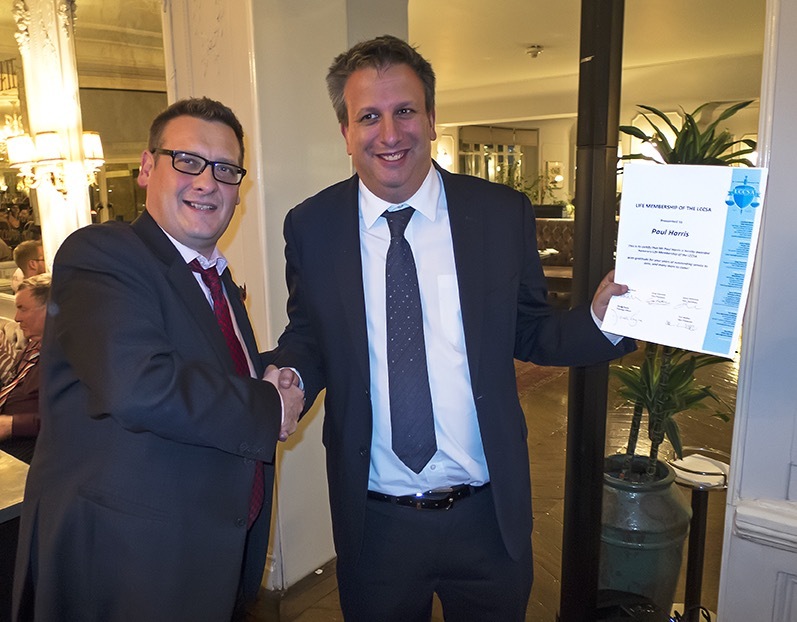 Paul has served 25 years at Edward Fail. He has served several lifetimes at the LCCSA. He was President, and has remained an active supporter, writing and editing the TT, serving on committees, meeting Secretaries of State, mixing it up with Judges on the CRC. Members , please raise your glasses and toast….Paul Harris! 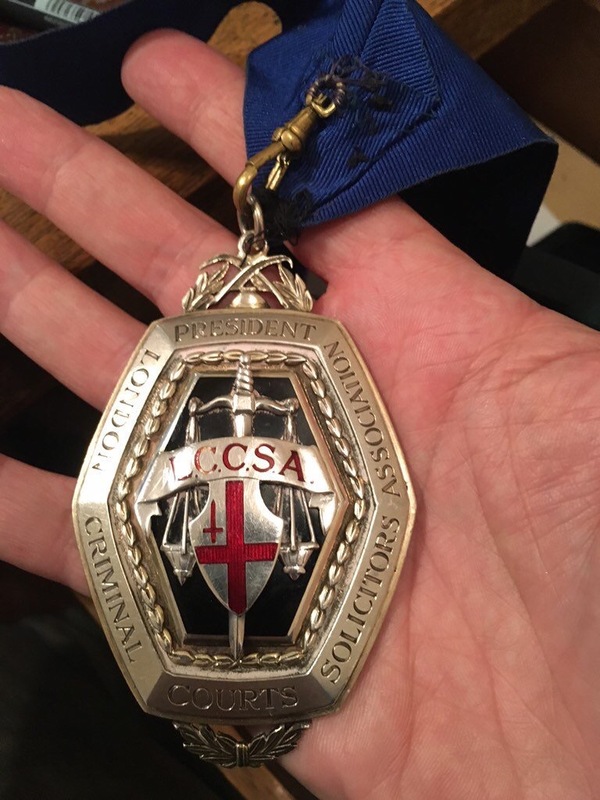 It was whilst at EFBW that I was first introduced to the LCCSA. I couldn’t join as an “articled clerk” , but came to the Summer dinner- or the “touts ball” as it was still known -when a solicitor couldn’t attend. I was possibly the youngest attendee there. 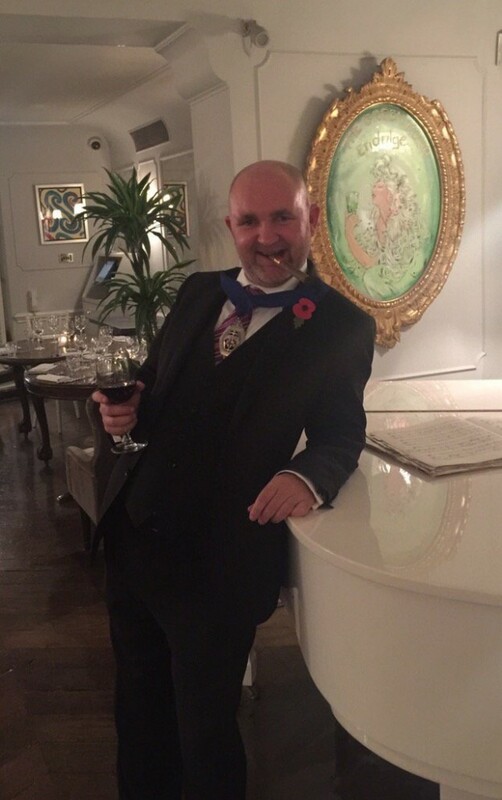 It was black tie, and the Grosvenor ballroom was crammed full of hundreds of senior lawyers, Judges, QCs, partners. I apprehensively descended the staircase, into bacchanalian mayhem. There was reckless and heavy consumption of alcohol and …c e n s o r e d , the speeches were drowned out in a cacophony of noise, and there was later a disco where portly senior counsel with red braces matching their dickie bows were throwing themselves around like John Travolta. It was a hideous, Hogarthian display of unrestrained over indulgence. After articles I joined a firm in Walthamstow where I began my advocacy, attending daily at WFMC. Those who say solicitor advocates “don’t have the training”, clearly didn’t have the experience of daily attending a MC with a busy list, and defending in trials before case-hardened magistrates. It was the very best training. On my first day I represented somebody with 50+ convictions, which was therefore at 50 more court appearances than I had. I built up Civil Libs experience, and enjoyed deploying the HRA. Happy times. Unfortunately, there was a dark cloud hovering over us at that time, a malevolent, brooding presence. I refer of course to the Carter review. 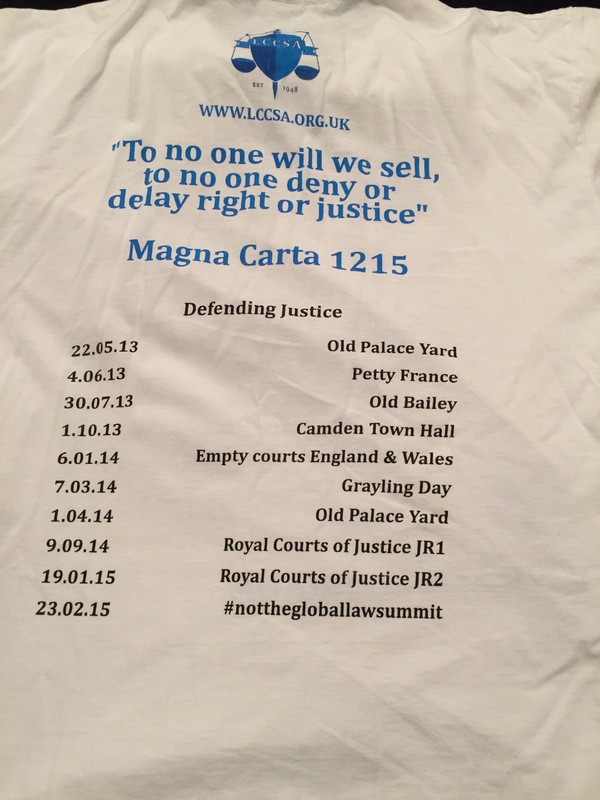 At the time that was considered to portend the destruction of criminal legal aid work as we knew it. Little did we know what was to come. There I gained Higher Rights and began advocacy at the Crown Court. I have enjoyed that ever since, but am constantly reminded of the status of HCAs. I know my place! One of my hopes for this year ahead is to improve and extend Advocacy Training through the LCCSA, working with SAHCA. 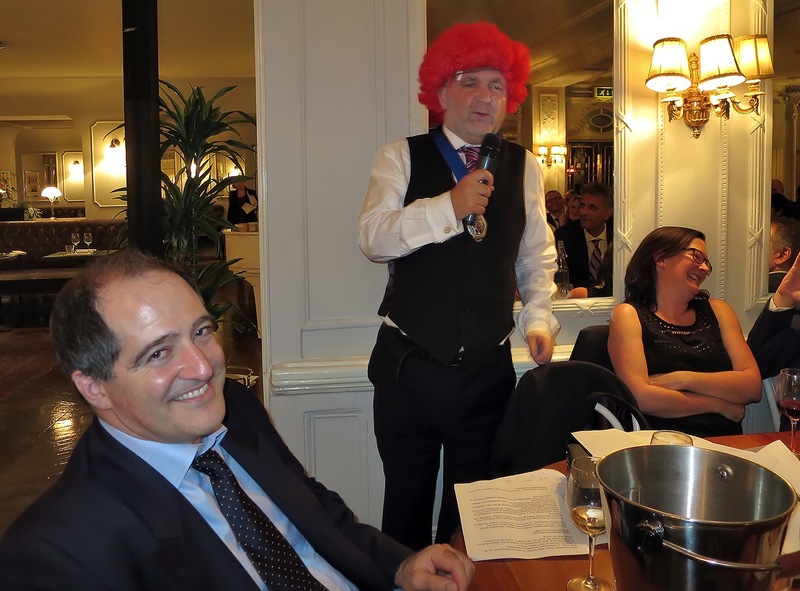 SAHCA -who are represented her tonight-battled for better treatment of HCAs, and successfully won the right for Solicitor Advocates to wear wigs in the interests of parity, a right I have myself not chosen to exercise. Last week there was a report published which criticised the experiences of non-lawyer participants at the Crown Court, in which reference was made to the alienation felt by ordinary court users confronted by barristers swishing about in gowns and wigs. Perhaps after all the wearing of a wig enhances the status of the advocate. Finally- freelancing. I think I am the first President who is an independent freelancer. But throughout all I have been in the LCCSA. I have enjoyed the benefits and the camaraderie. As President, I will keep the traditions and key services, but do some things differently too, I’ve blogged about it, no need to repeat it here tonight. I even have an LCCSA Police Station ID card, although not renewed mine since 1999. For several years I had annually renewed and always carried my ID card, but never actually been required to produce it. Until….the one day that I forgot to carry the card, which of course was the day that PC Precious demanded one. I had other ID of course, and explained my role. “But how do I know you are a solicitor?” asked our suspicious Plod. Ignoring the logic of this, Plod again suggested that I may be an “imposter”, to which I responded that he may want to arrest me for Pervertingthe Course of Justice or impersonating a solicitor, which would at least achieve mr required wish and get me into custody. 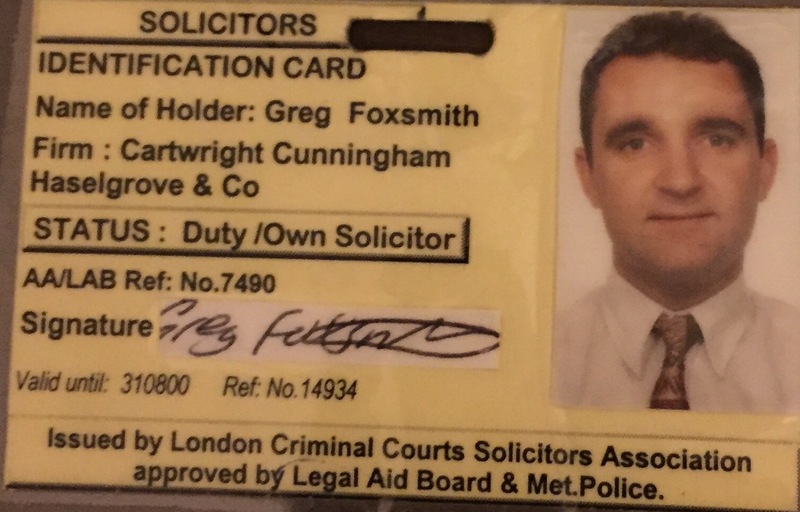 Firstly, that I would gain access (which I did) and furthermore that I would never again carry an ID card to a police station (which I have not) -and although my childish response has created many an enjoyable argument over the years, it is not a course of conduct that I recommend others to follow…. I still had hair then.I no longer have the hair. Perhaps another reason why I am, after all, better off with a wig…. For last 3 years the LCCSA committee have been on a rollercoaster. We have been under a sustained attack, and we have fought back. We have campaigned, protested, demonstrated, withdrawn services, and been on strike. We have battled the most infamous and incompetent of Lord Chancellors, the odious Chris Grayling. We have rallied in Parliament square, outside Westminster Magistrates Court, the Old Bailey and MoJ HQ, and we walked from Runnymede to Westminster, and an impeachment hearing for the Lord Chancellor. And we took legal action against the MoJ, with our JR at the High Court. I was at all those events, this committee were there, and I know that in person or in spirit you were all there every step of the way. We now have an opportunity to talk to Mr Gove and the Government,and to make the case against cuts and for a properly funded sustainable justice system. This year we will by necessity be less focussed on direct campaigning, this is a year for consolidation and focussing on our core commitments. As a freelancer, I work for big firms and small, private and legal aid, two-tier contracts, single-tier contracts and lots- of -tears no contracts. I want the Association to represent all those interests too. I want us to be more diverse, broader, larger, stronger. I want to be representative and democratic- its your association – what do you want from it, what can you give to it? If you are not already a member, please join. If you are a member, encourage others to join. Please give generously to our JR costs appeal. I pass now to our guest speaker, Karl Turner MP. Karl was a barrister who practiced criminal law, and now ably represents his Hull constituency,one of the safest Labour seats. He has been and remains a staunch supporter of Legal Aid, and spoke at our rally in Parliament Square. Karl, we are very glad to have you here. Members, friends, thank you all for coming. This entry was posted in Featured on November 14, 2015 by Greg Foxsmith.